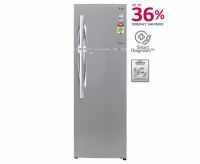 LG 5 star rated energy efficient refrigerators with 250+ litre capacity. You can see list of our LH GL-D302JNSZ vs LG GL-D292JNSZ (5 Star Rated) below, perform Side-by-Side comparison. If you need further help, do have a look at Conzumr Guides and Tips. Alternatively you can view all Refrigerator to choose your own favourites. This 5 Star LG Frost Free refrigerator features LG Exclusive Smart Connect Feature that helps connect your Referigerator to run on home inverter which consumes Power less than 2 CFL Bulbs during power cut. It is also equipped with New Smart Inverter Compressor which saves Energy Upto 36*%. With Ever Fresh Zone and Moist Balance Crisper the Fruits & Vegetable remains fresher for a longer time. Additionaly It has the ability to work without a stabilizer. To Recieve updates and possible rewards for LG GL-D292JNSZ please sign in. To Recieve updates and possible rewards for Refrigerator please sign in.